Carried for Blue Line in the 1960's, paired with ex-GUCCC Renfrew. Lucy is a wooden butty built at Braunston for the carrying fleet of John Knill, entering the fleet in 1953. She started being built by Frank Nurser at the Samuel Barlow Coal Co.'s boat dock at Braunston in 1951, and was first registered at Daventry as number 548 on 24th February 1953. She was re-registererd by Barlows Ltd. in January 1955, and worked by them until 1962. Finally she was re-registered by Blue Line Cruisers Ltd. on 12th April 1962. Steered by the Whitlocks, and paired with motors Renfrew and Ian, she finished carrying on the long distance Jam 'Ole Run in October 1970, and retired to Braunston with the Whitlocks in 1971. Rose Whitlock lived on her outside the Marina until 1977. 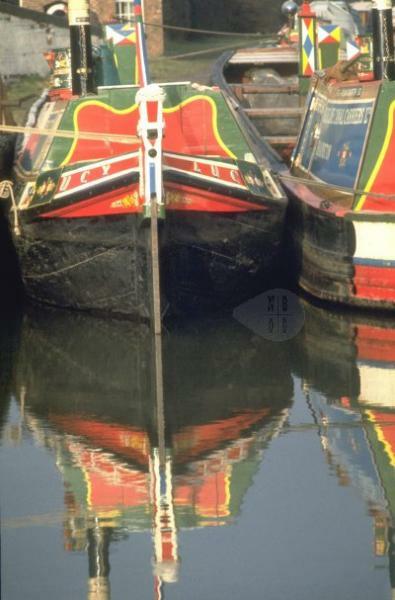 Since 1977, she had been a private residential boat, and latterly sank at Braunston Puddle Banks. In 2008, she was acquired by Pete Boyce as the start of a reconstruction project of this most important wooden Braunston-built butty. In May 2009, she was raised from the mud and placed on a purpose built cradle in the Tess yard at Braunston Turn.